Snapchat is fighting back against Instagram Stories, which rocketed to 100 million daily users by spotlighting the cloned feature atop the feed. To make Snapchat more “friends first,” it’s moving friends’ Stories above Discover where they used to be to make sure you don’t miss people you care about. And to make it easier to watch all your favorites friends’ Stories without the boring people in between, Snapchat is eliminating auto-advance, which automatically moved you on to the next reverse chronological Story when you finished watching the last one. Auto-advance will be replaced with Story Playlist, a new feature that lets you tap the thumbnails next to multiple Stories you want to load, then watch them all back-to-back by hitting the big “play” button at the bottom. This essentially formalizes an emergent behavior where users would scroll down tapping Stories to start them loading, then scroll through again to watch each, one at a time, once they’d loaded. The updates are rolling out to some Android users today and all iOS and Android users soon. So what will happen to the Snap Ads that Snapchat inserted between the auto-advance Stories? Those mid-roll ads will now appear mixed into Story Playlists you watch. But there’s also a new ad placement. If you decide to just watch one story at a time, Snapchat may append a post-roll Snap Ad at the end. This way, Snapchat can earn money no matter how you watch Stories, either singularly or in bulk. That’s important, considering the company is reportedly planning to IPO as soon as March at a $25 billion or higher valuation. Snapchat needs to prove it has plenty of diverse revenue streams to convince Wall Street of its financial security. 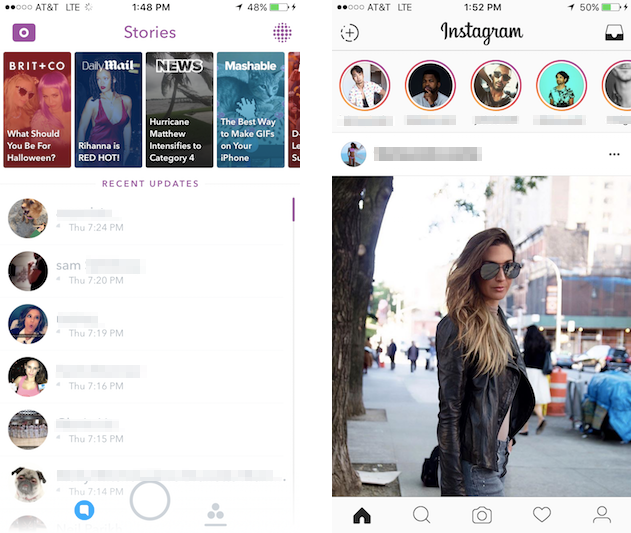 Though Instagram admitted its Stories are a blatant rip-off of Snapchat Stories, the product’s rapid ascent could hamper growth for Snapchat. Instagram made the feature unmissable by planting it smack-dab at the top center of its main feed, rather than hiding it in a separate tab. By comparison, that made Snapchat’s Stories list that shows professionally made Discover channels at the top above people you follow seem less about friends and more cumbersome. After two years, Discover doesn’t need that prominent cross-promotion above Stories any more. It already has its own page in Snapchat. The move might rattle publishers who’ve invested heavily in producing unique Snapchat Discover content, since the move shows Snapchat isn’t afraid to demote them. The move is reminiscent of Facebook’s recent News Feed changes that ranks “friends first” above publishers. Discover is nice, but most people open Snapchat to see people they know, and the product wasn’t properly reflecting that. Now Snapchat’s priorities are clear: fending off Instagram and proving its money-making potential before it goes public.